Lahore: Former governor Punjab Ch Muhammad Sarwar has said that people are being killed in the police stations ,where is Punjab government? incumbent rulers have given the gifts of lawlessness,unemployment,price hike and loadshedding to the masses. 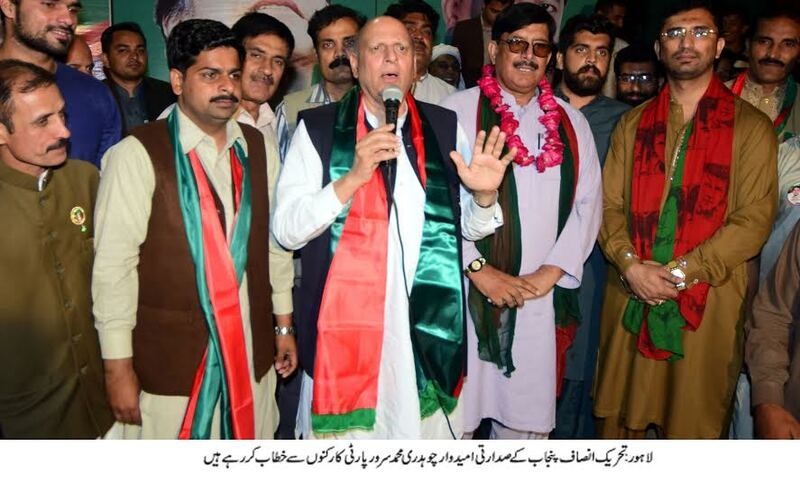 While talking to the party workers,Ch Muhammad Sarwar said that PML-N leadership had made the promise of ending loadshedding within six months but they could not honour their commitment event after three years of rule.He said loadshedding is being enhanced day by day,killing of a under custody person in police station Nawankot is not less than a terrorist act,Ch Sarwar maintained. The candidate for PTI Punjab president slot alleged that Sharif Brothers performed like a villain of Punjabi films but now their style has quite changed.PML-N has made a deal with the people whom they had promised to make a symbol,democracy can not be strong in the country in the presence of Sharif ‘s rule,he concluded.